I can’t remember the first time I read Kidnapped, but it stayed with me. When I took a class on children’s literature as I was preparing to become a teacher, Kidnapped was the book I chose for a report. I read it again before going to Scotland for the first time, and have read it additional times since. I have also read a half dozen other works by RLS, but Kidnapped began it and remains my lodestone in things regarding the author. Robert Lewis Balfour Stevenson was born at N. 8 Howard Place, Edinburgh, on the 13th of November, 1850. That is a quotation from RLS’s cousin and first biographer Graham Balfour. While RLS was still a child, his father changed the spelling of his name to Louis, without adopting the French pronunciation, because he was angry with a contemporary politician named Lewis. RLS himself dropped the Balfour to make his name shorter for his literary works. Balfour was his mother’s maiden name. Despite dropping it, RLS was fond and proud of his maternal ancestors — so much so that he used the name for the main character David Balfour in Kidnapped. Two recent things brought my long time fascination with RLS to the surface for these posts. First, a character in my latest novel is his doppelgänger. My character Balfour is — and is not — RLS. He has been “transmigrated”, for want of a better word, into an alternate London. He has minimal memories of RLS’s life and death, and is trying to recover them. Like most of the rest of the characters in Like Clockwork, he spends the novel trying to figure out what the hell is going on. To tell more would be a spoiler, and besides, Balfour only explains things to me as he learns them, and the two of us haven’t reached the end of his book yet. The second thing that brought RLS to the fore was The Great American Read on PBS. I watched the premier and looked at the 100 books on offer to be crowned as America’s favorite book. RLS was nowhere to be seen. How could this be? Surely either Kidnapped or Treasure Island should have made the cut. And if not, what about The Strange Case of Dr. Jekyll And Mr. Hyde? I’ll say more about The Great American Read in a later post. All this sent me in search of a more comprehensive biography of RLS than the one I had picked up in Scotland. I had avoided too much research when I began Like Clockwork, but by the time The Great American Read reignited my curiosity, my Balfour had become an established separate entity in my mind. I no longer had to worry about being sidetracked by an excess of reality. I went to my favorite underfunded library where they never throw books away — because they can’t afford new ones — and found volume II of the Graham Balfour’s 1901 biography. Volume I was missing, although I eventually got a look at it online. It was a bit dense, as well as being too old fashioned even for me. Also Graham Balfour was a cousin, writing under the eye of a very protective family. I ended up with the Pope-Hennessy biography, a work that is thinner, more up to date, and not written by a relative. Pope-Hennessy has an honest reputation and gives a balanced view. RLS’s life was a bit of a soap opera, so I will stick to the highlights. The first key to understanding him is that he was sickly from birth, and his mother was sickly before him. His father was a robust engineer, who carried on the family business of building lighthouses. RLS’s schooling was late starting and continued irregularly. Bouts of ill health punctuated his whole life. In fact, part of his appeal during the Victorian era was his illness. In that era, it was romantic to be clinging to life, or falling to suicide, and tuberculosis was a particularly romantic way to go. 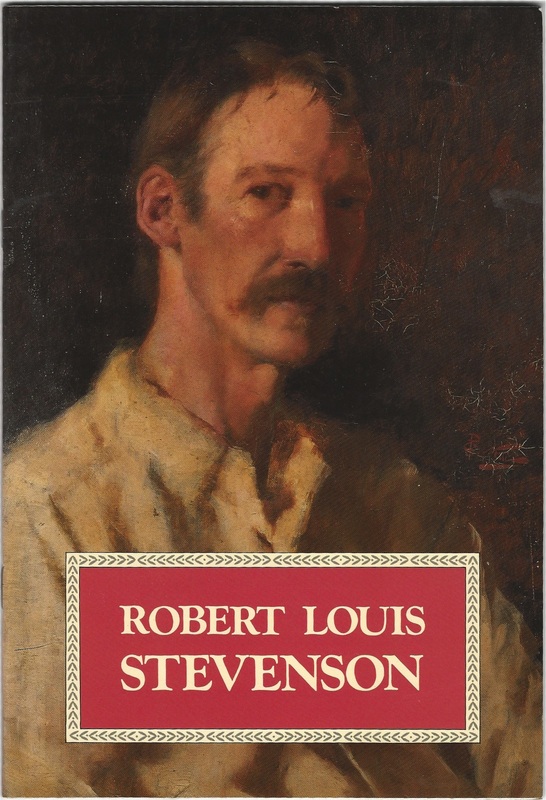 The elder Stevenson intended him to follow in the family business, but RLS chose from an early age to be a writer. His father, fearing that he would become dissolute, restricted his allowance to such a degree that RLS lived a strange life of poverty throughout his young manhood, alternating with travel and convalescences that would only be available to the wealthy. Shortly after writing his first book, Inland Journey, in 1878, he met Fanny Osbourne, an American woman who was separated from her unfaithful husband. RLS’s love for her was instant, intense, and permanent. When she returned home, he followed her to America where he almost died in Monterey before moving to San Francisco, all in pursuit of Fanny. She eventually received a divorce and they were married. During this time RLS was constantly writing, receiving positive reviews, but little money. RLS, Fanny, and her two children returned to England, but could find no place suited to RLS’s ill health. During this period he wrote his best loved works, Treasure Island, Kidnapped, and The Strange Case of Dr. Jekyll and Mr. Hyde, but could find no easing of his tuberculosis. In 1888, RLS, Fanny, and her two children, now financially secure from his novels, left for the South Pacific. They never returned. This was the first place that had allowed RLS to gain the health that had eluded him throughout his lifetime, and he was unwilling to leave it. He settled in Samoa, where he lived his last years, dying at forty-four. By that time he had written many works I have not had space to mention, and left the novels St. Ives and the Weir of Hermiston unfinished. I future posts, I will talk about some of those works. Biographies — Graham Balfour, The Life of Robert Louis Stevenson, 2 volumes, 1901. James Pope-Hennessy, Robert Louis Stevenson, 1974. Forbes Macgregor, Robert Louis Stevenson, 1989. The last is a an excellent summary biography in 29 pages, shown at the head of this post. It is sold in Edinburgh to tourists who probably never read it. Interestingly, the author’s name is buried at the bottom of the last page. Writer’s get no respect, even when they are writing about other writers. This entry was posted in A Writing Life and tagged history, literature, memoir, review, writing on July 9, 2018 by sydlogsdon.